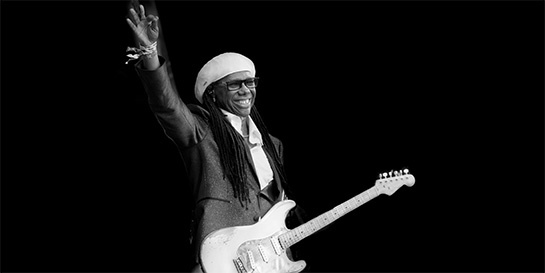 The wait for the highly anticipated new album from Nile Rodgers & Chic ended on Friday with the release of It’s About Time, the group’s first new album in over 25 years. Released by Virgin EMI, the album was recorded in cities across the world although it began, ended and was mixed and mastered at Abbey Road Studios where Nile is now Chief Creative Advisor. Having made Abbey Road his creative base in the UK, Nile used the studios to record a wide range of contemporary collaborations for the album, which also features Elton John, Emeli Sandé and Lady Gaga. Nile says, “Right now the world feels the same way as when Chic started. Chic promised good times, a way out, a new world even when things looked bleak. In the middle of chaos, certain songs can make you feel triumphant. I’m not denying things have gone apocalyptic, but we might be safest on the dance floor with the likes of Cosha, Mura Masa, Stefflon Don and Vic Mensa”. As the co-founder of Chic, Nile pioneered a new musical language with chart-topping hits like Le Freak and Everybody Dance, even sparking the advent of hip-hop with Good Times. His work in Chic and his production work for artists like David Bowie, Diana Ross and Madonna has helped sell over 500m albums and 75m singles worldwide, while his innovative, trendsetting collaborations with Daft Punk, Avicii, Sigala, Disclosure, and Sam Smith have kept him at the vanguard of contemporary music. Following a festival-filled summer with performances across the world, Nile and Chic will kick off their UK headline tour this December.